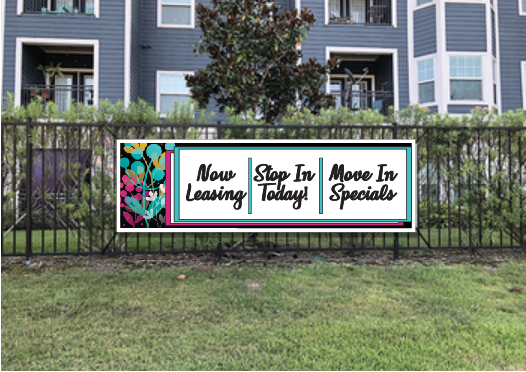 Black Flowers Apartment Banners are used to promote your apartment complex. 3' x 10' Banners are printed in full color. You can use for announcements, directional signage and advertising. Our banners are made of 13oz premium vinyl and provided with nickel grommets. You can attach to a fence with tie straps. Use indoors and outdoors, vinyl banners are an economical way to advertise. Black Flowers Apartment Banners are usually placed on fences or gates.